The forward has attracted interest from a number of clubs. Arsenal striker Benik Afobe could be on the way out of the club permanently with ESPN claiming that the North London side are in talks with Wolves over a permanent deal. Afobe has been afforded little chance to shine at the Emirates and has been on loan at MK Dons since the start of the season. The 21 year old has been impressive at the League One club, however, and famously scored twice against Manchester United in the Dons 4-0 rout of Louis Van Gaal’s side. In total he has managed 19 goals in 30 games. The England U-21 international has attracted interest from higher up the football league due to his good form and the likes of Huddersfield and Millwall are also interested in signing him but Kenny Jackett’s Wolves are in prime position. The MK Dons coach Karl Robinson confirmed Afobe was missing from there Dons line-up at the weekend as he was in discussions with an undisclosed club; which ESPN now claims is Wolves. 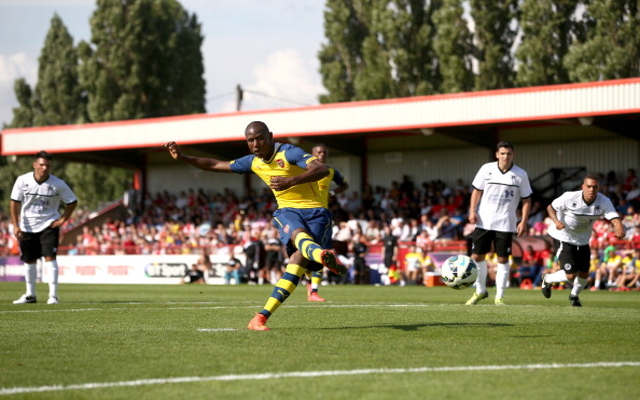 The permanent move would bring an end to Afobe’s time at Arsenal, where he came through their youth ranks but never made a first team appearance. As he is unlikely to feature in Arsene Wenger’s future plans for his side, it appears the club have looked to sell him on.